The NXT Genuine Article, Diversified. of distinctively-styled, highly-versatile templates - Now Updated for Pages 7+. The crisp, ordered clarity of Geneva is now available for Pages. Designed from the ground up to communicate your message with a clean, objectively straightforward style. 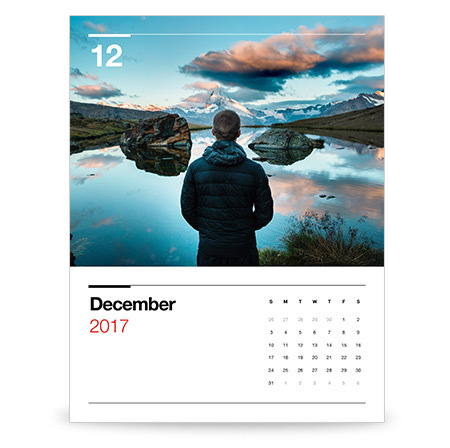 Geneva for Pages includes the everyday essentials for business, in a crisp, minimalist style that accents the more complex designs of the Brochures, Newsletter, or the namesake Keynote Theme. The Geneva templates for Pages, like their Keynote counterparts, pay homage to the ethos of classic Swiss design and the International Typographic Style with a distinctly modern take on the tenets of the timeless, minimalist style. Colorful Title & Callout layouts bookend a range of crisp, white Content and Narrative layout styles, all set against a refined, classically-informed grid with an intuitive visual hierarchy. Geneva for Pages includes a full suite of up to fifteen complete templates (Pro Edition) - from the basics of Letterhead, Memo and Envelope templates to Posters, Brochures and the magazine-inspired Newsletter - giving you a wide range of document types and layout options to choose from, whether you're preparing an Agenda for the weekly meeting or assembling next season's Quarterly Report. Each of the extended layouts feature clean, easy-to-read type set in an intuitive, visual hierarchy designed to maximize clarity and minimize distraction. The accompanying chart styles include both expanded & narrow-spectrum color-based palettes, along with a tonal greyscale option perfect for making callout/contrast charts. And the Geneva for Pages templates are fully optimized for the new Shape, Text and Chart Styles introduced in Pages 5 - so you can customize the principal color and type styles used throughout your documents to match your own corporate color or type standards in just a few short steps. Geneva for Pages offers a wide range of narrative and photo-oriented layout options - with unique accents and layouts that speak to the theme's print-inspired heritage - in an intuitive framework that's well suited for Editorial spreads, Product Galleries or anything in between (Horizontal Brochure shown). Geneva for Pages includes up to 15 complete templates (Pro Edition) in both US(Traditional) and ISO(Metric) formatted template bundles, each including template-specific Page Masters that are built to extend upon the core character of each document style. From the basics of Letterhead, Memo and Invoice to Project Proposal, Report, Newsletter and Brochure templates, your essential document/collateral types are covered - including a range of in-template variations so you can pick both the document type and the layout style that's right for your specific needs. Can't imagine leaving your favorite portable device out of your work-flow? 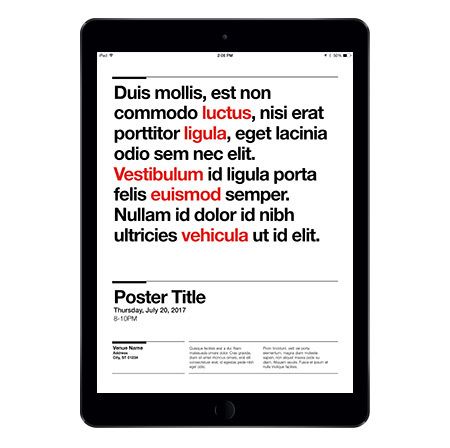 The Geneva for Pages templates are fully compatible with Pages for iOS, so you can transfer a document using the Geneva templates to your iPad or iPhone for reading or editing with no updates or special workarounds required. Or collaborate with colleagues in real-time, whether they're on a Mac, iPad, or iPhone - even on a PC using iWork for iCloud - with consistent results regardless of the device you're using or where your team is located. The Geneva for Pages templates include all-new Add-On Templates to make building your document system even easier. New Smart Calendar Templates enable you to create a variety of custom Text & Photo Calendar styles in a few short steps: simply change a date field, and the Smart Calendar does the rest of the work for you, automatically populating each calendar on the page, leaving you to focus on any notes or highlights you'd like to add. Each Smart Calendar sheet is fully localization-aware and adaptive for all regions/localizations supported by Pages 6.x-8.x. Pages makes it a snap to create sophisticated brochures, letters and business documents with absolute ease. From the ease of drag + replace photo placement, to the power and flexibility of the document-wide Style assignments that ensure your documents look consistently great from page to page, Pages makes it easy to create layouts rich with both typographic and visual style. And most importantly - Pages gives you the power to create documents that are every bit as visually compelling as their counterpart Keynote presentations, with the same ease of use and stellar results you've come to expect from Keynote. With Geneva for Pages, you can put that power to use with absolute consistency - from presentations to collateral - in a sharp, Swiss-inspired style that maintains order while letting your ideas freely flow. 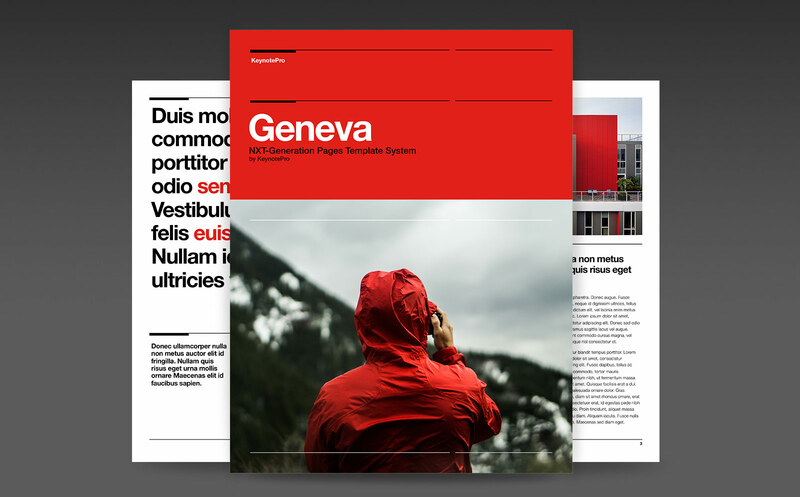 The Geneva Newsletter Template includes 15 tailored layouts in a refined, magazine-inspired style - a perfect complement to the more traditional approach of the Brochures and business papers. View a Geneva (NXT) for Pages Sampler PDF (5MB). Requirements. Geneva (NXT) for Pages requires Pages 6.0 or higher, and the Helvetica Neue font face. Geneva for Pages in Action. 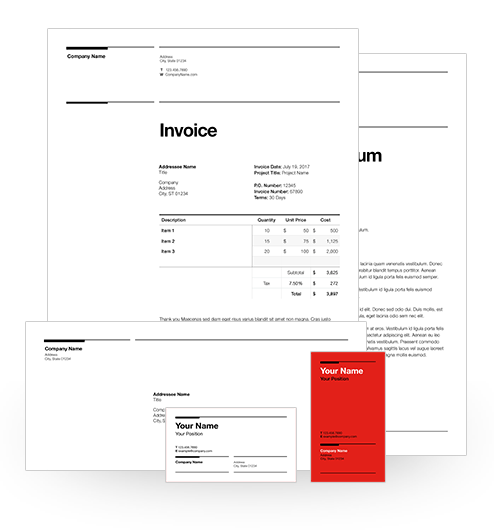 Geneva (NXT) Template System for Pages 6.x-8.x: Vertical Brochure, 3-Panel Brochure, Business Cards, Letterhead, Memo, Invoice, Resume and Envelope Templates (US and ISO), "Getting Started" guide. Add this template set to a Bundle with 2 other KeynotePro themes or templates - a 10$ savings. Geneva (NXT) Template System for Pages 6.x-8.x: Vertical Brochure, Horizontal Brochure, 3-Panel Brochure, Newsletter, Large Poster, Small Poster, Meeting Notes, Report, Project Proposal, Business Cards, Letterhead, Memo, Invoice, Resume and Envelope Templates (US and ISO), "Getting Started" guide. Add this theme to a Bundle with 2 other KeynotePro themes - a $10 Savings. Geneva (NXT) Template System for Pages 6.x-8.x: Vertical Brochure, Horizontal Brochure, 3-Panel Brochure, Newsletter, Large Poster, Small Poster, Meeting Notes, Report, Project Proposal, Business Cards, Letterhead, Memo, Invoice, Resume and Envelope Templates (US and ISO), "Getting Started" guide, Geneva (NXT) Pro Themes for Keynote 6.x-9.x: Standard Definition and Widescreen (SD/HD) Themes, Supplemental presentation containing Fills/Palettes, Focal and Interactive Objects, "Getting Started" guide.